Oven baked pork cocktail sausages. 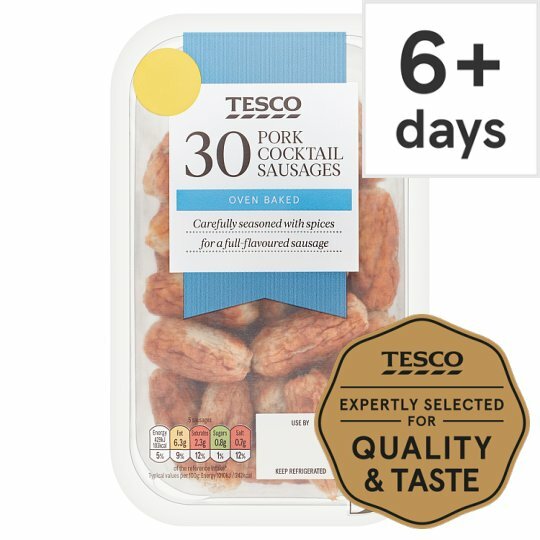 Tesco 30 Pork cocktail sausages. Oven Baked Carefully seasoned with spices for a full flavoured sausage. INGREDIENTS: Pork (61%), Water, Wheat Flour (Wheat Flour, Calcium Carbonate, Iron, Niacin, Thiamin), Salt, Dextrose, Sugar, Stabiliser (Disodium Diphosphate), Raising Agent (Ammonium Bicarbonate), Spice and Herb Extracts, Black Pepper, Yeast Extract, Mace, Nutmeg, Rapeseed Oil. Filled into U.K and non U.K beef collagen casings. Defrost thoroughly for a minimum of 4-6 hours in the refrigerator.